13 tracks: Gravel Path * Roo Joey * Gone But Not Forgotten * The Dark Island * The Mist Covered Mountains * Lexie * The Misses MacMillan * Celtic Cottage * The Piper * Funky Paddy * The Sleeping Tune * High Road to Itchiness * Cuimhneachan. Ross Munro started playing the bagpipes under Pipe Major John D Burgess MBE at an early age. At seventeen he joined The Royal Scots Dragoon Guards. After the mega success of the Spirit Of The Glen trilogy of albums on Decca Records, in which Ross played a pivotal role as Pipe Major on the Classical Brit award-winning album Journey, Ross became widely known. He retired from the army in 2013 to start a new professional career in music. Ross is a multi-instrumentalist and Twisted Tradition takes you on a musical journey with a playful and yet seriously inspired variety of original and traditional tunes. Ross first worked with producer Iain McKinna of Offbeat Studios in Edinburgh when Ross was Pipe Major of the Guards on the Spirit Of The Glen trilogy. The first record reached Number One in the UK Classical Charts and the second album Journey achieved a Classical Brit Award for best album in 2009. 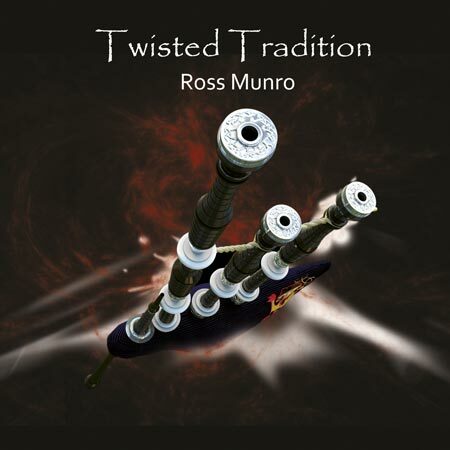 On Twisted Tradition, Ross plays most of the instruments and also showcases his arrangement skills. The sound of his haunting pipes, which Ross has blended with whistle on some tracks is truly special, adding to his unique uplifting sound. This is pipe music with twist. Iain McKinna plays bass, drums and guitar on various tracks, Kirsty Anderson adds vocals on track 8 and Simon Lowden plays bass on track 1. Design and artwork by Graham Monaghan. Read about Ross signing with Greentrax at the Offbeat Recording Studio blog.